Expert Baseball Picks, MLB Predictions & More! We take your privacy seriously. Your information will NEVER be sold or shared for any reason! Why Las Vegas Sports Insider? Why Choose Las Vegas Sports Insider? Do you have questions? Connect with us and get answers. LVSI offers free baseball picks & premium baseball handicapping predictions on a subscription basis that are available during the regular MLB season. Let our performance record speak for itself & compare our service with others. Price, Performance, Results! Go with the proven winners at Las Vegas Sports Insider. 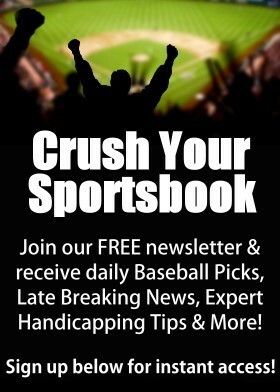 Disclaimer: LasVegasSportsInsider.com is not affiliated, endorsed, nor licensed by MLB© (Major League Baseball). The information and advertising contained on this website are for news and entertainment purposes only. Internet gambling is legal in over 80 countries, however, some of this websites' advertising links may be deemed illegal in your jurisdiction. Site visitors are warned to inquire about the legality of participating in any activities offered by these websites. Any use of this information which violates any federal, state, or local laws is strictly prohibited. The owner of this website assumes no responsibility for any of your actions and makes no representation or endorsement of any of the activities offered by these advertisers. As a condition of viewing this website viewers agree to hold the owner of this website harmless from any claims arising from the viewer's participation in any of the games and/or activities offered by the advertiser(s).